In General not attempt to clip your bird's wings yourself . 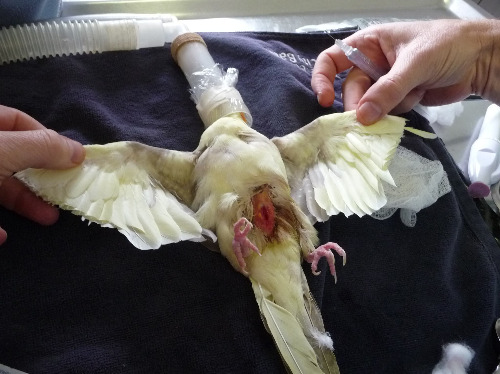 Unfortunately we often see wing clip injuries in birds, as a result of badly clipped wings. There is a good reason that It is actually illegal in Victoria to clip a bird's wings except on the guidance of a veterinarian experienced in working with birds. 1) Most flighted indoor pet birds will benefit from a light (mild or gentle) wing trim. 2) A light wing trim helps enormously with initial training and socialization. 3) A wing clip is NOT usually done to stop a bird from flying. (just use more energy flying)- like using weights in a gym to exercise. 4) A wing clip does not guarantee that your bird will not fly away. 5) There are pros and cons to wing clipping. Wing clipping is NOT generic. Each wing clip done at Bird Vet Melbourne procedure is different - done for a particular species and then for a particular bird depending on their weight and athletic ability, agility and life style. These are circumstances in which the Avian vets doing the wing clipping can enhance a pet bird’s quality of life, as well as improve the bird’s ability to integrate well in a family situation. Other benefits of correct wing clipping in birds. Owners should be aware that a wing clip does not guarantee that a bird taken outdoors cannot escape. * phobias and feather picking - Yes psychological issues.. If wing trimming is done before a bird first learns to fly, some birds will not be able to fly later in life, even when normal new feathers are moulted through. Wing clipping is not a procedure to be taken lightly. Bird specialist Dr Pat suggests "In trying to decide whether wing clipping may be appropriate in a particular instance, the first question to be asked is why clip wings on this bird and this time and what style clip is likely to achieve the desired outcome?" If wing clipping is decided upon, the style of wing clip recommended will depend on the size, weight and athletic ability of the individual bird as well as what an owner hopes to achieve by wing clipping. There is not a single generic style that is suitable for all situations. The avian veterinarians at Burwood Bird Clinic generally try to do a wing clip consistent with achieving the desired outcome. We clip feathers symmetrically on both wings. Which feathers are clipped and how much is removed will vary from bird to bird. Clipped feathers will fall out at the time they would normally moult and new feathers will grow in their place. If clipped immediately after a moult a wing clipping may last up to a year, if clipped just before a moult, new feathers may emerge within weeks of a wing clip. If a pet bird’s wings are clipped, owners need to be particularly vigilant to protect their bird from predators or accidents (e.g. being stepped on).